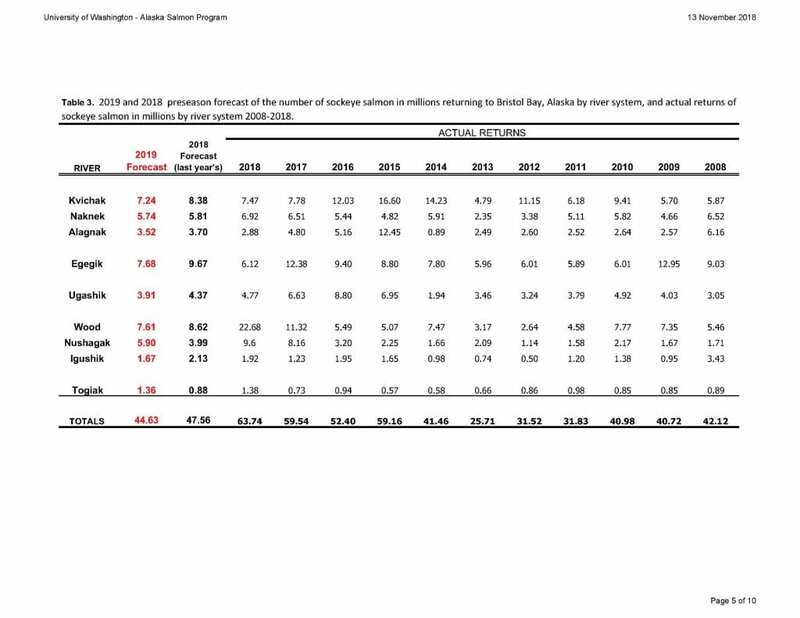 The 2019 Bristol Bay sockeye salmon forecast is 44.6 million. This forecast is within 1% of the recent 10-year average (44.9 million) and 11% higher than the recent 20-year average (40.3 million). This estimate is the sum of individual predictions for each of the predominant age classes (1.2, 1.3, 2.2, 2.3) for all nine major river systems – Kvichak, Egegik, Ugashik, Naknek, Alagnak, Wood, Nushagak-Mulchatna, Igushik, and Togiak, and the contribution of Nushagak 0.3 and 1.4 age classes (Table 1, Figure 1). The predicted inshore harvest based on this forecast is 30.7 million sockeye with an estimated weight of 181.2 million pounds (Table 2). To generate the forecast for inshore harvest we subtract: 1) estimated escapement to each river; in most cases the number for the upper bound of the lower bin of the ADF&G escapement goal range, except in the cases of the Kvichak and Alagnak rivers where we assume a harvest rate of 50%, and 2) an estimate of the 2018 South Peninsula harvest from the predicted total run (1.35 million salmon). 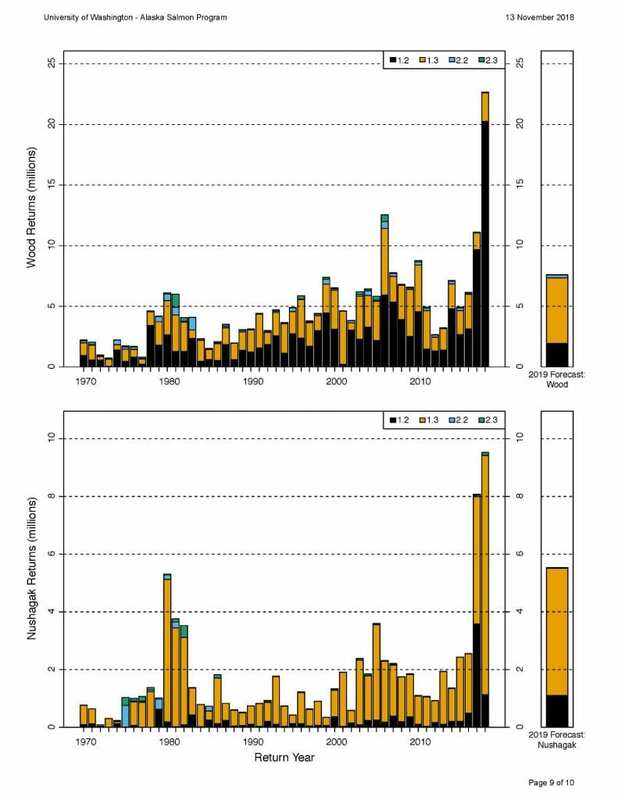 South Peninsula catch for 2019 is estimated as the average of the catch (South Unimak and Shumagin Islands) from 1990 to 2018. 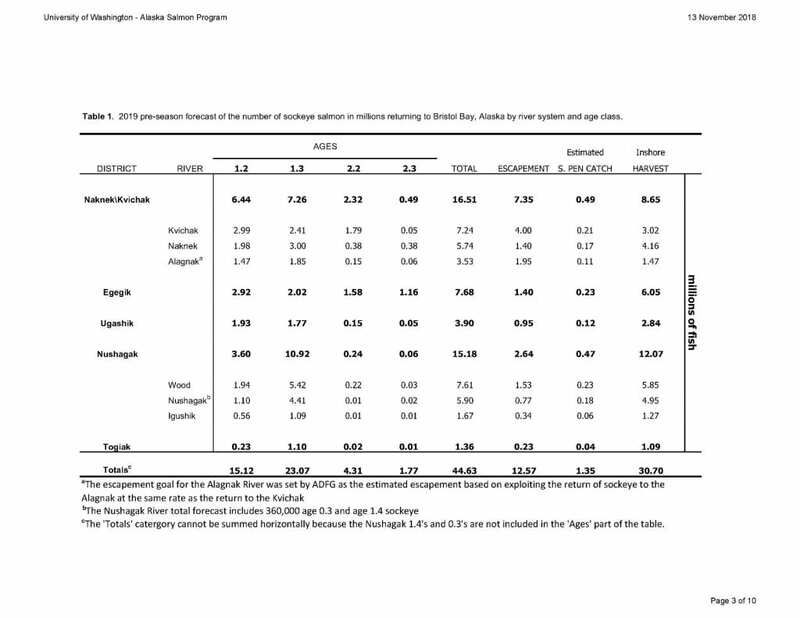 Harvest values for 2019 given in Tables 1 and 2 are “forecasted” inshore harvest, differing from what we have referred to as “potential” harvest in prior preseason forecasts only by the removal of the estimated 2019 South Peninsula catch. This harvest estimate depends on observed escapement in 2019 equaling the assumed values in Table 1, and industry’s ability to harvest all surplus fish. To determine the harvest in pounds for each age group we multiplied the forecasted catch by the long-term average weight of 2 or 3 ocean fish for Bristol Bay sockeye runs totaling 38 million sockeye or greater (4.9 lbs and 6.6 lbs, respectively). 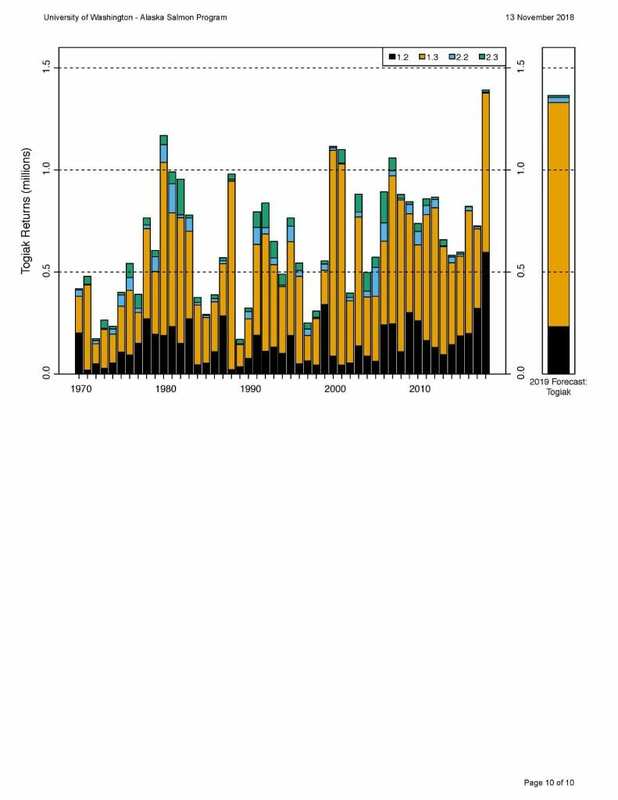 The 2019 Bristol Bay forecast of 44.6 million sockeye is 30% and 25% lower than the large observed sockeye runs in 2018 and 2017 respectively, but is still significantly (32%) higher the long-term (1960-2018) average Bristol Bay run size of 33.9 million sockeye. The 2018 season in Bristol Bay was record setting in several respects: 1) the largest total inshore run, 2) the largest return to the Wood River by more than double, and 3) the largest harvest within the Nushagak District. 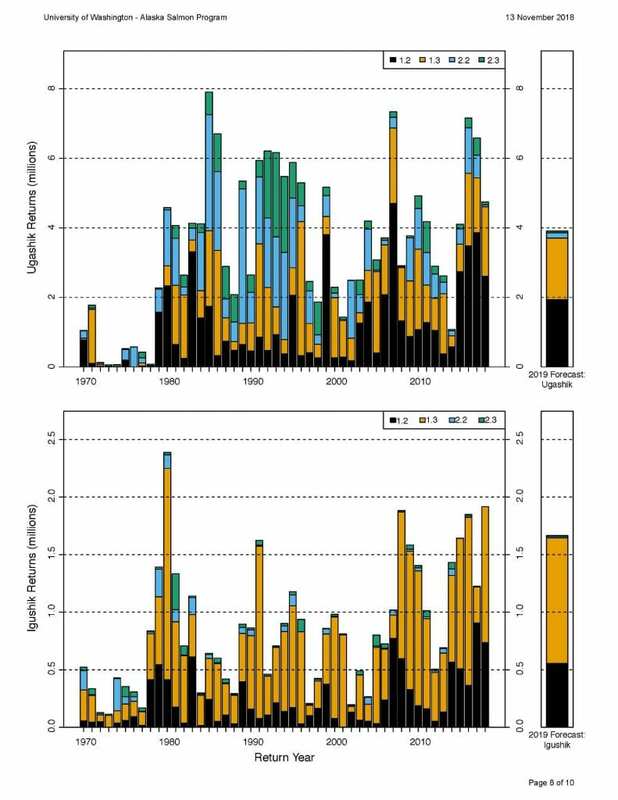 However, the 2018 run included few 1-ocean sockeye and thus resulting more modest expectations for 2-ocean sockeye returns in 2019 than were observed in the previous four years. For the 2019 forecast of 44.6 million we expect 44% 2-ocean sockeye and 56% 3-ocean sockeye. Historically, the average range for weight of 2-ocean sockeye is 4.6-5.4 lbs and 6.4-7.5 lbs for 3- ocean sockeye. 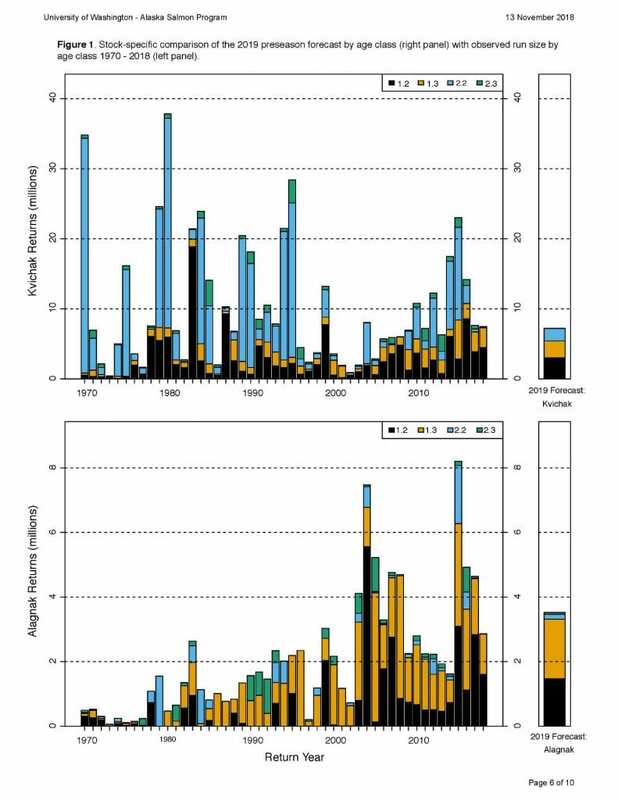 Historical catch and escapement data collected by the Alaska Department of Fish and Game and reconstructed using methods described in (Cunningham et al. 2018) from 1963 to present were used to generate the 2019 forecast. The overall UW-ASP Bristol Bay forecast is comprised of 38 individual stock by age class forecasts. The majority of these 2019 stock-age forecasts were generated from models based on prior returns of “siblings” or younger ocean age-classes from the same stock and brood year, but returning in previous years. Returns of siblings are informative because they experienced the same environmental conditions as juveniles in freshwater and at ocean entry as the age class being forecasted, and should exhibit similar patterns in survival. For all forecasts generated based on sibling abundance data, rather than simply choosing the best sibling relationship for each age and river, we use a technique that weights the forecasts for all potential predictor sibling models according to how well each has performed in the past. While the best sibling relationship carries the most weight in our forecasts for each stock-age group, retrospective analysis indicates that there is useful information conveyed by other models (i.e. sibling models that include alternative age classes and different combinations thereof), and that this information increases forecast accuracy. In addition to sibling-based forecasts, several other forecast model types were used based to their performance in recent years. In five instances (Ugashik 2.2, Igushik – 1.2 and 2.2, Alagnak 1.2 and Togiak 2.2) forecasts were produced using auto-regressive integrated moving average models (ARIMA), which generate forecasts based on how well patterns in a time series of data predict future values. ARIMA models consider the level of autocorrelation in the time series of returns for stock-age groups, in addition to the moving average of the forecast errors in prior years, and are independent of the information provided by the abundance of sibling age classes. In addition to ARIMA models, in recent years we have made increasing use of Dynamic Linear Models (DLM). DLMs are sibling models where both the intercept (average production of the forecasted stock-age group) and coefficients describing the effect of younger sibling age classes are allowed to change over time. As such, DLMs should be more robust to environmentally-driven variation in average survival and the chances a salmon returns after 1, 2, or 3 years at sea. DLMs were used in nine instances (Naknek 1.2, Egegik 2.2, Ugashik 1.2, Wood – 1.3 and 2.2, Nushagak – 1.2, 1.3 and 2.3, and Togiak 1.3). Finally, ensemble models that average the range of forecasts generated by all model types under the assumption that multiple models provide predictive information were selected in three instances (Alagnak 2.2 and 2.3, Nushagak 2.2) for the 2019 forecast. Cunningham, C. J., T. A. Branch, T. H. Dann, M. Smith, J. E. Seeb, L. W. Seeb, and R. Hilborn. 2018. A general model for salmon run reconstruction that accounts for interception and differences in availability to harvest. 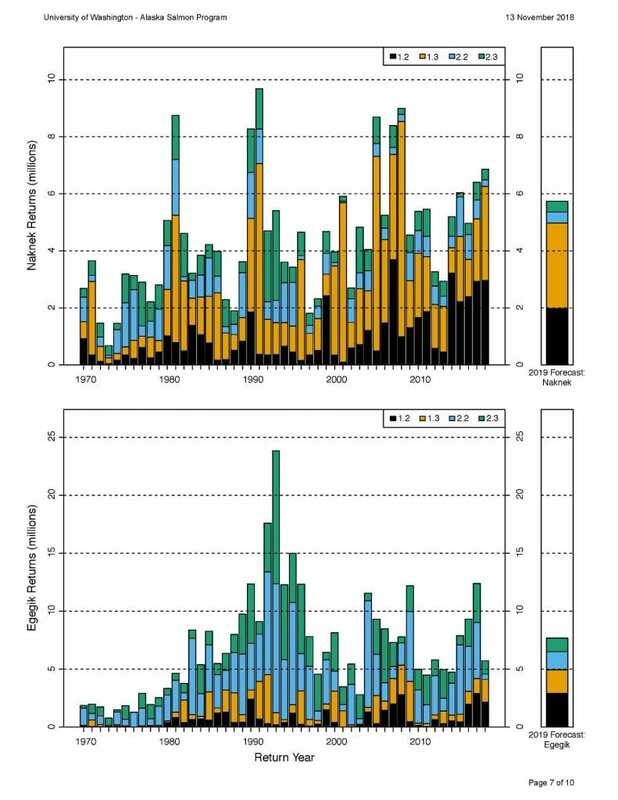 Canadian Journal of Fisheries and Aquatic Sciences 75:439-451.